Time to Follow Tesla Executives and Run for the Hills? In late January, we noted that Tesla (TSLA: $342/share) CEO Elon Musk’s executive compensation plan raised significant red flags. Since then, proxy advisor Glass Lewis recommended investors vote against the proposal, which could grant Musk performance-based options worth over $2.6 billion. The red flags haven’t stopped there. More executive departures, more missed production projections, and competitors taking market share have left Tesla’s sky-high valuation with even more downside risk. The launch of the Model 3 marks a critical period for Tesla. As the company struggles to hit production targets on its first mass-market vehicle, one would hope the executive team is confident in the company’s future and working as a cohesive unit. Instead, the company is losing top executives at an alarming rate. In February 2017, Jason Wheeler, then Tesla’s CFO left the company after being hired in 2015. Then, in early February 2018, Jon Mcneil, then Telsa’s president of global sales and services left the company to join Lyft as its chief operating officer. Just last week it was announced that Eric Branderiz, then Tesla’s Chief Accounting Officer, was leaving the company for personal reasons less than two years after joining the firm. While speculation can run rampant about possible reasons for leaving, and we certainly hope all is well with Mr. Branderiz, one thing is known. When hired in October 2016, Mr. Branderiz was provided a $5 million equity grant that vested over four years. His abrupt departure leaves a significant portion of this grant unvested. While executive departures are rarely a good sign, they’re especially alarming when an executive is leaving big money on the table. Tesla continues to experience production delays at its Gigafactory. In late January CNBC reported that the company is still producing certain battery components by hand and has been forced to borrow employees from supplier, Panasonic, as it keeps pushing back its production schedule for the Model 3. Bloomberg recently built its own Model 3 production tracker to determine how many Model 3s were being built. Using vehicle identification numbers, Bloomberg estimates that Tesla is building approximately 737 Model 3s per week. This estimate falls well below the 2,500 per week goal that Tesla hopes to achieve by the end of March. However, even this 2,500/week goal is a long-time coming. In August 2017, Tesla projected it would produce 5,000 Model 3s per week by the end of 2017. Rather than meeting these goals, a delay and subsequent lowering of goals has become the norm. 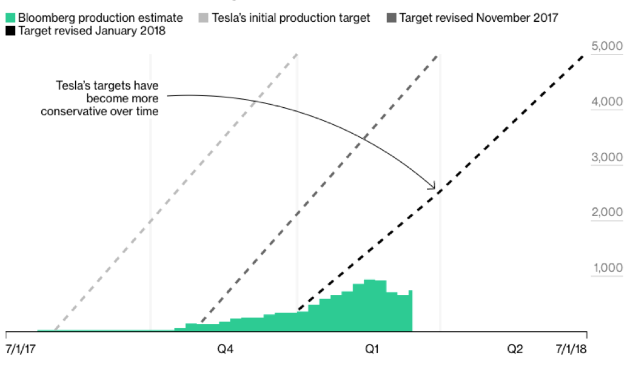 Per Figure 1, Tesla has routinely missed its initial and revised production targets since mid 2017. In what was once believed to be a significant competitive advantage, Telsa’s Gigafactory may prove just one large production facility amidst a litany of competent competitors. On March 13, Volkswagen AG announced that it secured $25 billion in battery supplies to begin an aggressive push into electric cars. The automaker plans to equip 16 factories (up from 3 currently) to produce electric vehicles by the end of 2022. The company also noted that a deal for North American markets will follow shortly and, in total, it plans to purchase 50 billion euros worth of batteries. For reference, Tesla currently has $17.5 billion worth of purchase obligations related to lithium-ion cells from Panasonic. Ignoring the fact that Tesla’s self-driving technology recently ranked last in Navigant Research’s study, competitors securing battery supplies means Tesla’s batteries may not provide the competitive advantage once hoped for. Worse yet, many of the aspirations Tesla has for its battery technology can’t be backed up. Some of its promises, like a semi-truck that can haul 80,000 pounds for 500 miles, may be feasible if battery technology continues to advance at the same rate. Other claims, like charging stations that will give those trucks 400 miles of charge in 30 minutes, appear completely impossible. To achieve the latter goal, Tesla’s charging stations would need a tenfold leap in efficiency. Apart from Volkswagen’s heavy capital investment in battery supplies, Tesla’s scale advantage should melt away fairly quickly due to other competition. Chinese companies are targeting battery factories that would out produce the Gigafactory more than 3 to 1 by 2021. Two former Tesla executives are building their own battery factory with the backing of VW. Without some unforeseen technological breakthrough, it’s hard to see how Tesla can have any long-term competitive advantage around battery production. For a time, Tesla had the competitive advantage of being the only quality, semi-affordable electronic vehicle on the market. That’s definitively no longer the case, as the Chevy Bolt alone outsold all Tesla models combined last October, and it nearly replicated the feat in November. The number of competing electronic vehicles coming out makes you wonder how many people will want to keep waiting a year or more to be able to buy the Model 3. If Tesla can’t fix its production issues soon, it may see its customers abandoning it for cheaper and more accessible options. As Tesla starts to face more competition, it faces a key disadvantage compared to more established automakers. While these incumbents have steady cash-flow streams coming in from their existing business, Tesla loses money as it tries to build up production and sell its cars below cost to attract a customer base. 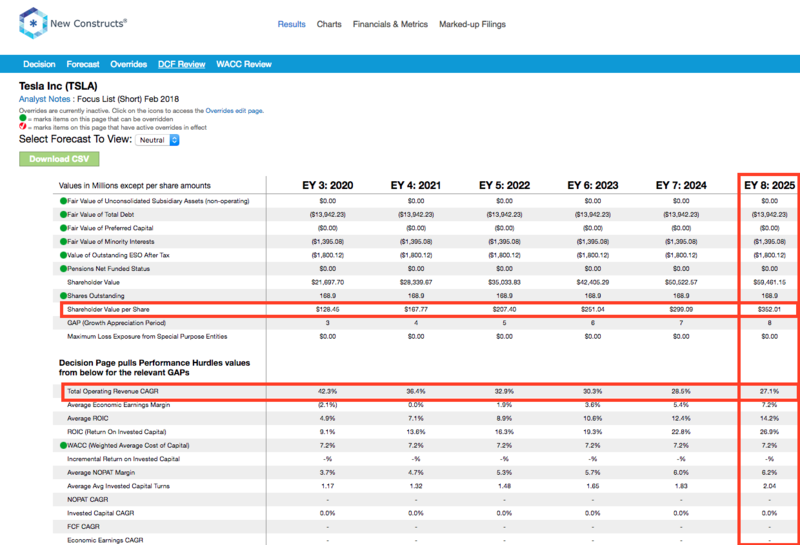 Figure 3 shows how far behind its peers Tesla ranks in terms of free cash flow and cash on hand. Tesla’s lack of cash flow limits the amount it can invest compared to competitors and makes it more beholden to capital markets. Operational struggles, of which the company has had plenty, can lead to more difficulty attracting capital, which creates a negative feedback loop that could abruptly amplify problems. No one needs to be told that the stock price reflects enormous growth expectations, but it’s worth quantifying how unrealistic those expectations really are. Even in spite of the executive departures and growing competition, TSLA is up 7% year-to-date, which is greater than the 3% increase in the S&P 500. This price appreciation in the face of so many potential issues makes Tesla even more risky. To justify its current price of $342/share, Tesla must achieve 8% NOPAT margins (between a mass-market and luxury car manufacturer, compared to -8% in 2017) within four years and grow revenue by 27% compounded annually for the next eight years. In this scenario, Tesla would be generating more than half General Motors’ 2017 revenue. For reference, GM produced 9.6 million cars in 2017 while Tesla produced just over 100,000. Those are ambitious expectations for a company with no track record of profitability and major problems with meeting production goals. Even if we assume Telsa’s NOPAT margin tops out at 4% and it can grow revenue by 22% compounded annually for the next decade, the stock is worth just $161/share today. This scenario represents a 53% downside in the face of what would still be fairly impressive operating results. 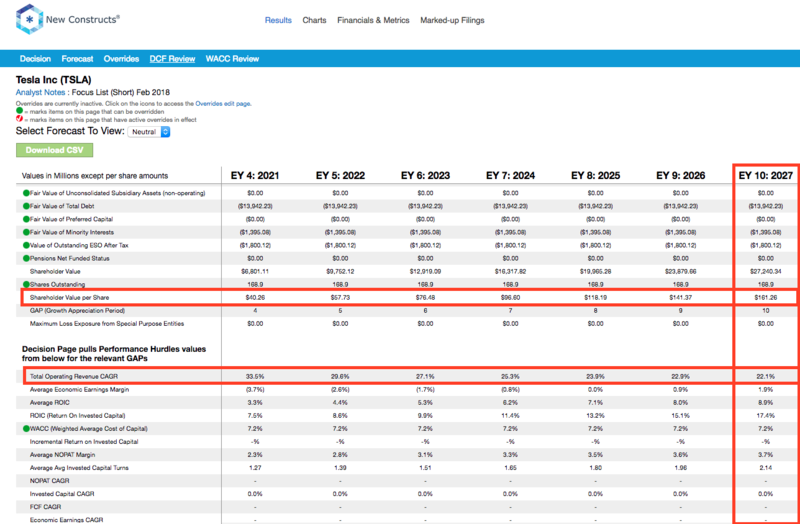 Each of these scenarios also assumes TSLA is able to grow revenue, NOPAT and FCF without increasing working capital or fixed assets. This assumption is unlikely but allows us to create best-case scenarios that demonstrate how high expectations embedded in the current valuation are. For reference, TSLA’s invested capital has grown on average $4.5 billion (38% of 2017 revenue) over the past five years. 2 replies to "Time to Follow Tesla Executives and Run for the Hills?" We’ve written several reports on Tesla since this one.